Why do House Cats Have Slit Pupils? Have you ever admired your cat’s eyes and wondered why their pupils look like narrow slits rather than round circles like ours? If you’ve visited the zoo recently or caught a wildlife show on TV, you may have even noticed that big cats like lions and tigers don’t have slit pupils either. So why do our miniature tigers have slit pupils when their wild cousins do not? 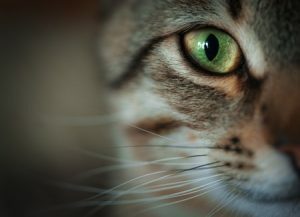 According to a study published in Science Advances, our cats’ pupil shape is the result of their unique ecological niche. In this study, a team of scientists analyzed the pupil shape and ecological roles of 214 different species of land animals. Based on their results they found that animals with vertical slit-shaped pupils tend to be ambush predators, but animals with circular pupils tend to be active foragers that chase their prey. Vertical pupils allow ambush predators to see clearly in both bright and dim lighting conditions, and they create an astigmatic depth of field that helps them judge the distance to their prey. “For species that are active both night and day, like domestic cats, slit pupils provide the dynamic range needed to help them see in dim light yet not get blinded by midday sun,” said study lead author Martin Banks of UC Berkeley. They also found that predators that are closer to the ground are more likely to have slit pupils as well. This distinction explains why house cats have slit pupils, while larger cats that are further from the ground do not. Although our cats have a great deal in common with lions and tigers, their pupil shape is the product of a different course of evolution that benefits smaller predators that hunt close to the ground. Allergies: What Can Affect Your Cat? Cat Scratch Fever – What Is It, Really?